Iaponia nova discriptio. 1636. Cartographer: Jodocus Hondius. Printed in Amsterdam by Johannes Janssonius. Iaponia regnivm. 1655. Cartographer: Martino Martini. Printed in Amsterdam. atlas in Europe (2). Popular indeed, it was republished a number of times over the years with new maps and information added to the revised editions. The atlas continued to be published even after Ortelius’ death and was on the 41st edition by 1612. These included 21 editions in Latin, six in French, five in German, four in Spanish, two each in Italian and Dutch and one in English (1). 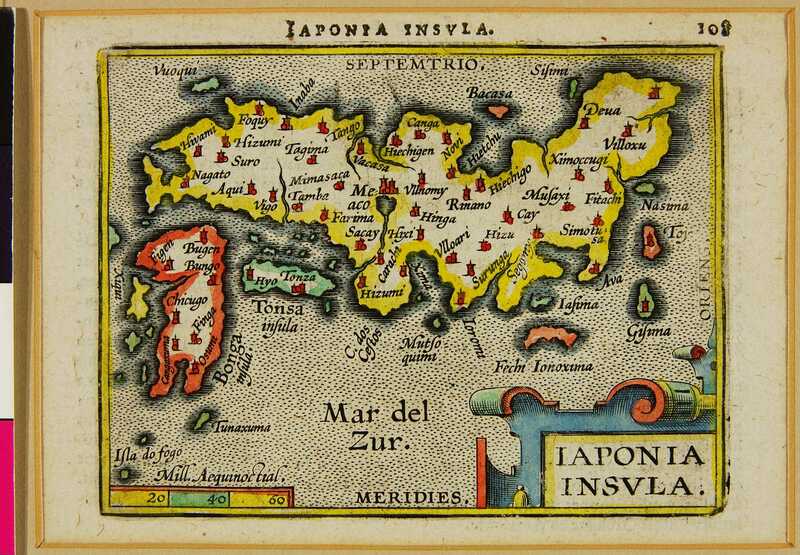 Teixeira’s map of Japan first appearance in the fifth edition of Theatrum Orbis Terrarum. 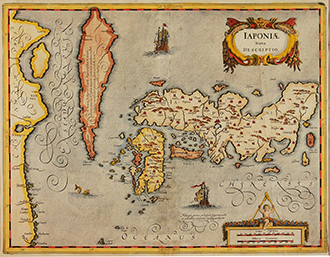 Teixeira writes in his letter dated 20 February 1592 that he has sent a map of Japan and another of China to Ortelius (3). Studying existing portolan charts (navigational maps used by sailors) from the period, there are few, if any, charts with the coastal contours of Japan observed as precisely as those found in Teixeira’s map. 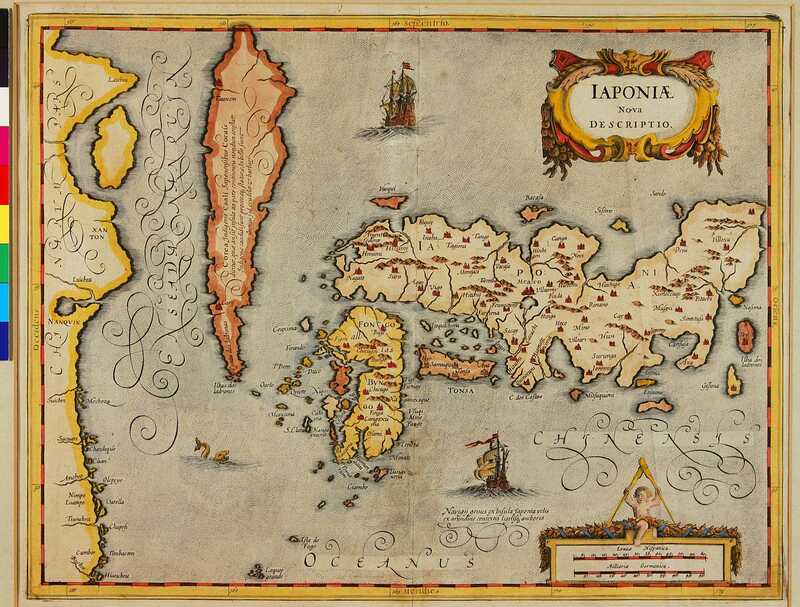 For this reason, Teixeira’s map was considered to be the most accurate depiction of Japan when it was first published in 1595 (2). As such, the map was referenced in other successive maps and atlases, and maps that resembled his were referred to ‘Teixeira type maps’. 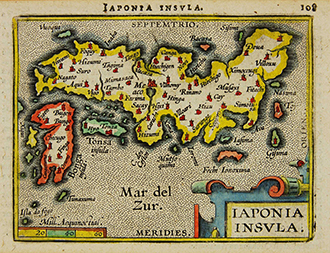 Iaponia. date unknown. Cartographer: Hercator-Hondius. Printed in Amsterdam. Here, I would like to introduce three variations of Teixeira type maps in the Cortazzi map collection at the Lisa Sainsbury Library. The first Teixeira type map is this compact version housed in the Library (click here for larger image). 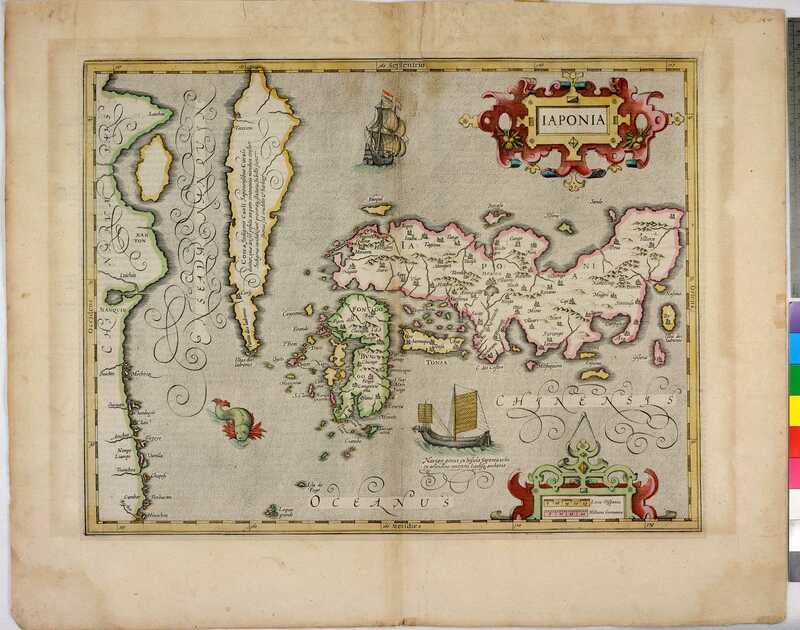 While the map of Japan in Orelius’ atlas of 1595 is impressively large with measurements of around 35cm x 49cm (height and width), this map published in 1598 is much smaller in comparison, measuring only 8cm x 10cm. It appears in Epitome, an atlas published in Antwerp by Ortelius (2). The map is not a mere reduction of the larger Teixeira map, but is a revised version with coastal outlines drastically simplified including the omission of smaller islands off the coast of Kyushu and Seto inland sea Island chains. The number of place names are also fewer. For example, the original Teixeira map includes the four domain names of Iyo, Awa, Sanuki and Tosa in Shikoku island. However, the smaller version denotes only Iyo and Tosa. It would be interesting to know the rationale behind why certain place names were kept while others removed, however, there is little evidence to shed light on the situation. 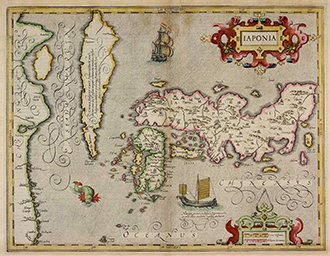 Other Teixeira maps housed in the Library include Heractor-Hondius’ Iaponia (click here for larger image) published in Amsterdam in 1606.
together with a description beneath the location name that ‘it remains unclear whether the land is part of the continent or an island’ (4). Teixeira type maps set the standard for maps of Japan which followed for over half a century until in 1655 when Martino Martini’s (1614-1661) map of Japan (click here for larger image) was published in Novus Atlas Sinensis by Joan Blaeu (1596-1673) (2). Martini was an Italian Jesuit priest who spent nearly ten years in China from 1642 on missionary work (1). I hope to introduce more about him and his cartography work on another occasion. 2. 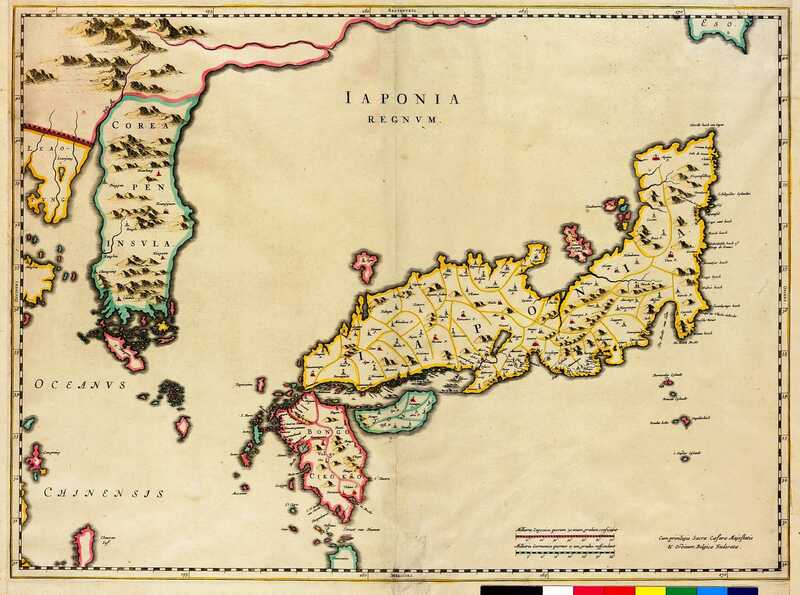 Hubbard, Jason C. Japoniæ insvlæ = The mapping of Japan. Houten: Hes & de Graaf Publishers BV, 2012. 3. Unno, Kazutaka. Chizu ni miru Nihon: Wakoku, Jipangu, Dai-Nippon. Tōkyō : Taishūkan Shoten, 1999. 4. Japan mit den augen des westens gesehen. Tōkyō : Kyōryūdō, 1993.